Thousands of food lovers crowded the streets of Yulin, South China's Guangxi Zhuang Autonomous Region, chatting, laughing and sweating while enjoying a feast of dog meat hotpot with lychee wine. Inside a nearby market, an acrid smell filled the air. Thousands of dogs were packed into crowded cages, barking and whining behind high chain-link fences. The butcher grabbed a dog by the neck and hauled it out of the cage, bashed its head in with a stick, pulled out a knife, skinned it, boiled it and chopped it up ready to be served. Despite widespread outrage among animal lovers, this annual dog meat festival kicked off on June 21. It is considered a local way to mark the summer solstice and legends say eating dog meat on that day will keep evil spirits and disease at bay. It is estimated that over 10,000 dogs were killed during the one-day event. Animal rights activists said the dogs are often strays or stolen from their owners in the countryside and might carry diseases that can be passed on to human beings. However, local officials say all the dogs are bred on farms. The ancient practice of eating dog has become increasingly distasteful for China's growing number of pet lovers and this year's dog meat festival has come in for particularly virulent criticism. 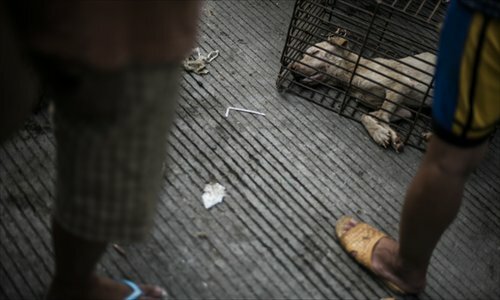 The name of Yulin, a southern city home to 6 million people, is now linked with its controversial dog eating. This summer solstice tradition by local residents began in the late 1990s when the trend of eating dog meat spread from the countryside to the city. As more and more dog meat restaurants opened, residents would invite their friends to go out and enjoy dog hotpot served with lychees and strong liquor. "You can smell Yulin before entering the city," a local resident named Ma told the Global Times. She left her hometown a decade ago and still thinks fondly of it. "I miss those summers when my family got together and enjoyed the dog meat and lychees," Ma said. "I don't understand why we can eat other animals without a fuss but not dogs." At first, the dogs were all raised locally but as business expanded and demand grew, butchers brought in dogs from across China. Animal lovers say many dogs were abducted from their rightful owners in the countryside, kept in inhumane conditions and then transported to the festival. A few years ago, dogs were butchered in public to show that the meat was fresh and answer other concerns about whether the meat had been stored in refrigerators. Since 2010, the local tradition has caught attention from animal lovers and animal rights organizations. In an open letter to the mayor of Yulin, Hong Kong-based NGO Animals Asia said the overcrowded trucks used to transport the dogs increased the risk of disease spreading. ""We have written to the local authorities to lodge our complaints and to outline the cruelty involved and the dangers of eating dog meat," said Suki Deng, Animals Asia China's cat and dog welfare manager. "Each year opposition to the event grows and the publicity surrounding the event becomes less favorable." Another 20 animal protection organizations also wrote an open letter to the Yulin government calling for the cancelation of the festival. "It is not just an issue for Yulin, it is important for the safety of dogs all over the country," it said. "We hope the local government can crack down on underground dog theft and reduce the consumption of dog meat." Yulin authorities earlier stated the matter was out of their hands as the festival is organized by local people, not the government. 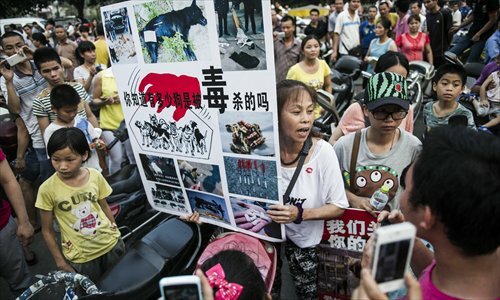 More and more animal rights activists have been converging on Yulin to protest in front of dog-eaters. Last year, artist Pian Shankong knelt down in front of a pile of dead dogs in Yulin to beg for forgiveness of the sins of those who killed them. This year, led by Du Yufeng, founder of Chinese animal rights group Boai Small Animal Protection Center, several volunteers protested outside Yulin's most famous dog meat market, carrying a banner saying "Stop the cruelty, do not eat dogs and cats." Their protest soon drew notice and the restaurant owner confronted the protesters while trying to wrench the banner away. The mood of the crowd seemed to favor the festival as onlookers asked "we eat chicken, pork and beef, why not dog meat? It is not against the law." There are no animal welfare laws in China. The ministry of Agriculture issued a regulation in April, requesting local governments to strengthen cat and dog quarantine measures to control the spread of diseases that can be transmitted from animals to humans. In response to this, the Yulin government doubled down on its insistence that all dogs eaten at the festival were raised on dog farms. But one local butcher told the Global Times that he does not pay much attention to the safety issue. "It is the government's job to decide whether it is ok to eat dog or not, my job is to kill them and make money, I don't ask where they come from," he said. Li Junqing, head of Yulin's food and drug administration, was spotted at the festival. His loyalties were quite clear. "If you try to stop people from eating dog meat, they might greet you with a knife," he was quoted as saying the Guangzhou-based Yangcheng Evening News as saying. Not all locals favor eating the dog meat. Tangwei Lingling, 24, said she never eats dog meat, helped animal rights activists with their campaign and acted as a guide to show them how to find the black dog meat market. "I have two dogs at home, I feel really sad to see how dogs are cruelly killed and eaten. As a local I need to do something to stop them," she told the Global Times. Animal lover Lisa from Shenyang, Liaoning Province came all the way to join Du's campaign in Yulin after seeing pictures of dogs being skinned. "Our protest doesn't seem to make a difference because there are too many dog eaters and not so many protesters," she said. However, the protest blazed a trail across the Internet. A month before the festival, animal lovers petitioned the While House's website, demanding an end be put to the tradition. "Please help us stop the Yulin festival of eating dogs in Guangxi. It is bloody and disregards life," said the petition created on May 12 and that has collected about 800 signatures. Online opposition has been further boosted with celebrities joining the cause. None of this seems to have phased local residents who have not been put off their canine treats. "Let's keep eating, let reporters take photos and show outsiders how to celebrate the festival" was the general sentiment around town. However, some restaurant owners told the Global Times that their business had worsened due to the ongoing protests. "There are rumors saying some people are going to come and put us in jail for killing dogs," one restaurant owner named Zhou said. "Our business is legal, I hope outsiders can show some respect for our tradition." It seems restaurants don't necessarily need to change their menus anytime soon as volunteers have been trying to buy the dogs' freedom. Activists pooled together nearly 100,000 yuan to buy the freedom of 450 dogs from the festival, which brings up another problem: what to do with the dogs that are freed. "The butcher holding a stick in his hands asks you only one question: will you buy it or let it be killed? We didn't have a choice," Du told the Global Times. "Now we are calling for more volunteers to take care of these dogs as many of them are sick." The tradition is not unique to Yulin. Other places in China such as Zhejiang and Guangdong Province are also known for eating dog meat. In ancient China, dog meat was considered a medicine that could warm up the body and boost male fertility. But not all authorities have been as stubborn as those in Yulin. In 2011, the government in Zhejiang Province cancelled a dog meat festival held every October in the wake of animal rights protests. "A festival can bring economic benefits to a city, but if it poses a threat to people's health and ruins the city's reputation, it's not really worth it," Professor Sun Jiang from the Northwest University of Politics and Law told the Global Times. Xie Changping, deputy director of the Guangxi Traditional Culture Research Institute, argues that eating dog meat "is just a traditional habit. Why do we have to follow Western values on this?" Zhang Dan, founder of the NGO China Animal Protection Media Salon, argues that if a tradition is becoming a bad habit, it has to go. "Eating dog meat is dwindling worldwide, it's behind the times," Zhang told the Global Times, "It may be hard to see this habit die out and the biggest challenge will be changing people's minds."